Thor's Helmet Nebula. Image courtesy Richard Crisp. Thor's Helmet Nebula (NGC 2259) is a bright nebula that surrounds, and has been blown off by the Wolf-Rayet star GSC 5407:3417 – the brightest star visible within the nebulosity. 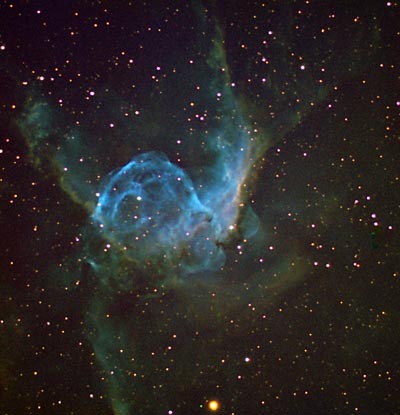 Although similar in nature to the Bubble Nebula, interactions with a nearby large molecular cloud are thought to have contributed to the more complex shape and curved bow_shock structure of Thor's Helmet. It measures some 30 light-years across and lies in the constellation Canis Major.